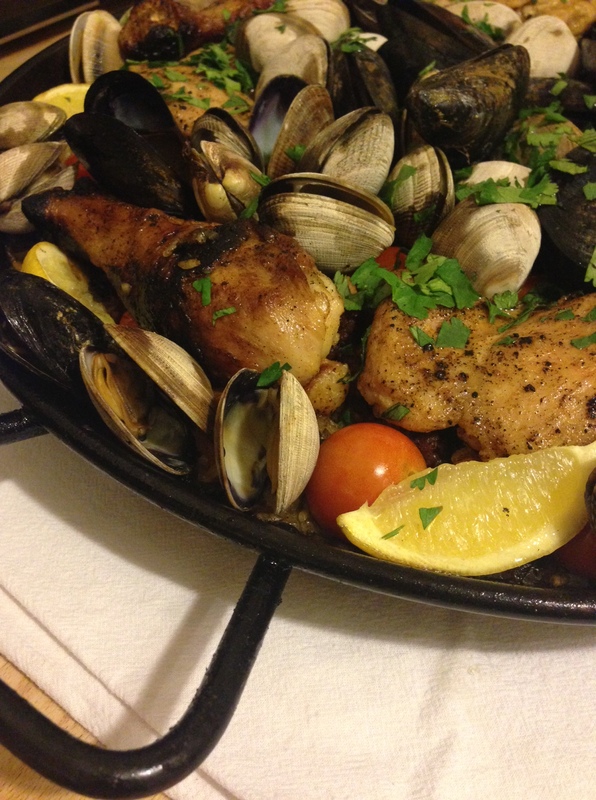 Last weekend, we put my shiny new paella pan to use on the grill and invited Dara and David, who had gifted me with the pan, to join us for the feast. 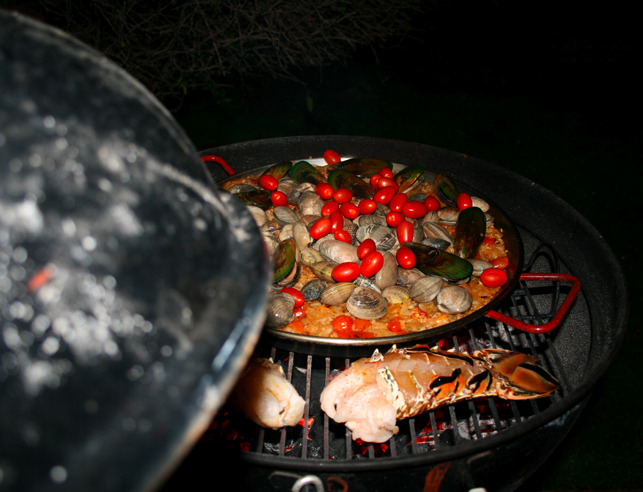 I found a Food & Wine recipe online for Mario Batali’s lobster paella on the grill and then Dara said that they had a container of lobster stock in the freezer, so it was easily decided that we’d make seafood paella on the grill (Mr. MVP insisted we use the Weber). Because Dara doesn’t eat meat and I don’t eat bell peppers, we knew we’d have to adapt whatever recipes we found and we ended up using Batali’s as a base. 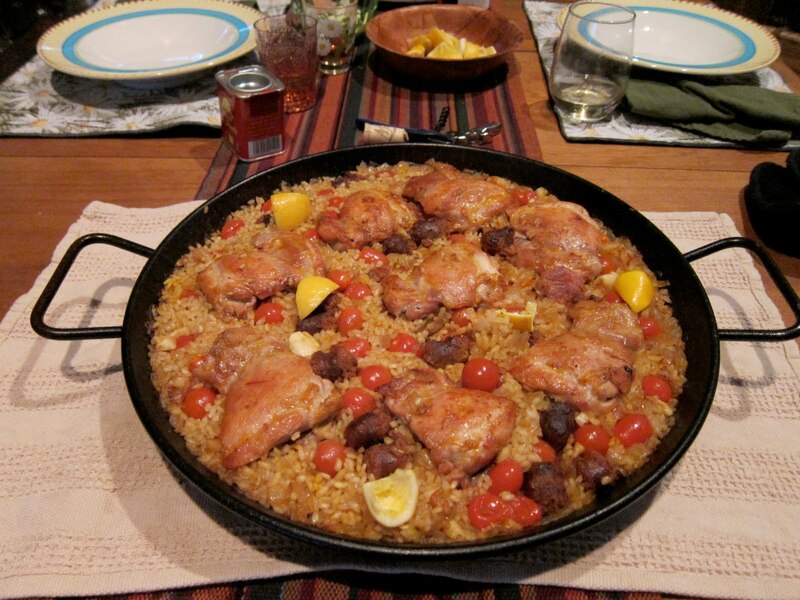 We dropped the meat and bell peppers and added grape tomatoes, a chopped habanera pepper, and smoked paprika. It was delicious. Recipe below. Light a grill with mesquite charcoal. Heat the lobster stock on a saucepan, for use later. 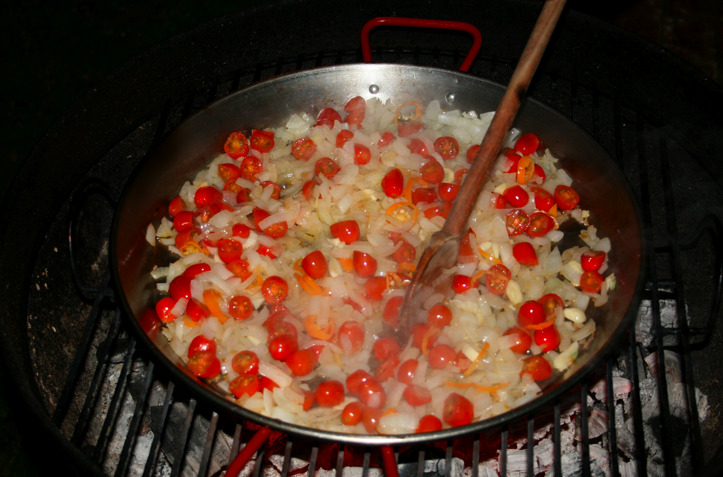 Chop 2 cups of tomatoes in half and set aside, separately from the remaining cup of whole tomatoes. 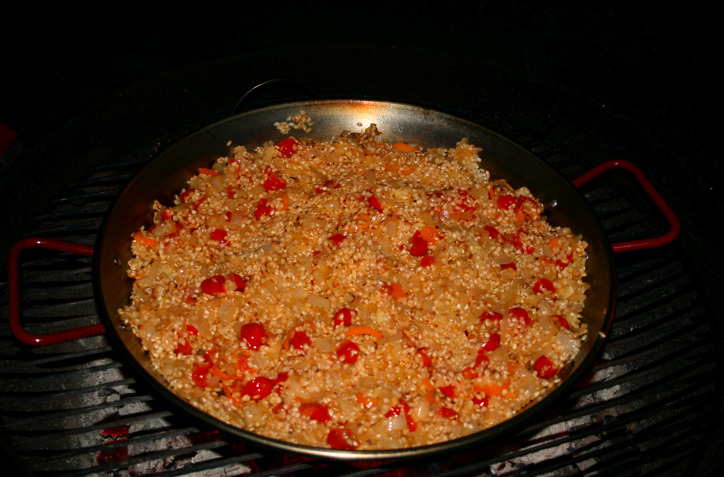 Place the paella pan on the heated grill and add the olive oil. Add chopped onions, garlic and the 2 cups of cut tomatoes. Stir occasionally until onions are softened, about 5 to 8 minutes. Add the rice and stir it in with the vegetable mixture and stir for 3 or 4 minutes. Add the warmed stock, saffron, paprika and a pinch of salt to the pan. 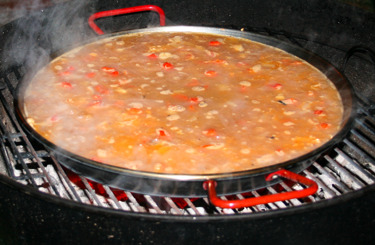 Cover the grill and cook for 10 to 12 minutes, until the stock has reduced to 2 cups. Drizzle olive oil and a dash of hot paprika on the lobsters and place them on the grill beside the pan, shell side down. 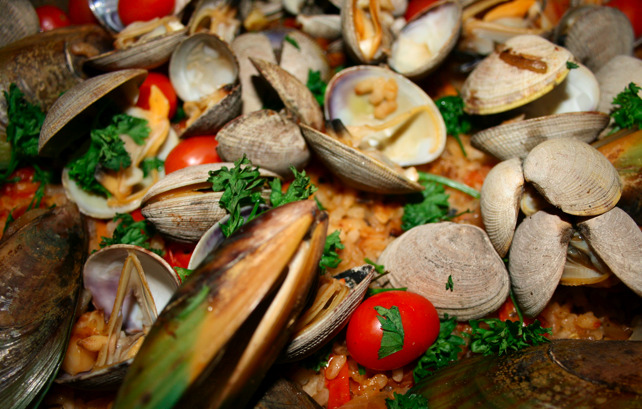 Add clams, mussels and remaining tomatoes to the paella pan and cover the grill. Cook for 10 minutes, checking occasionally to see if the clam and mussel shells have opened. 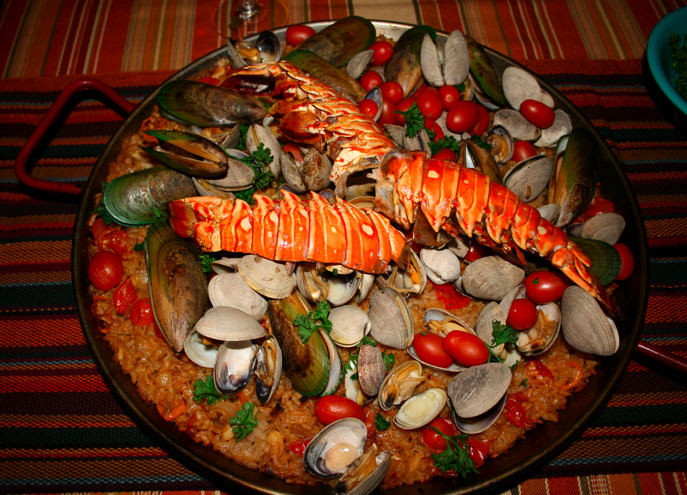 Remove lobster tails from grill and serve on top of a platter with the paella. Sprinkle with chopped parsley and lemon juice and garnish plate with lemon wedges.